The U.S. Federal Census Mortality Schedules have again provided me with information on a somewhat unusual cause of death amidst the various fevers, unknowns, accidents, and other maladies: intemperance. Information in these records was provided by people in the household, not doctors, so it may not always be 100% accurate but at least it allows to understand what the family or surviving household members believed to be someone’s cause of death. “Elisha M. Claughton, 40 (age), Male, Married, Virginia (place of birth), August (month of death), Stone Mason (occupation), Intemperance, 2 Weeks (duration of illness that caused death)”. The only other Ancestry record I could find on Elisha was that he was born around 1820. Another intemperance death from Pittsylvania County in Callands was that of Homer Howard, a married white male, aged 30, who died in 1879. There were other intemperance deaths, in other areas, so I decided to look into it further. Intemperance, or the excessive consumption of alcohol, was considered to be a major social problem in the 1800s. Alcohol abuse to the point of drunkenness not only wreaked havoc on the body, it was thought to lead to financial problems, homelessness, marital problems, profanity, crime, and various other “sins.” Marcus Cross goes into lengthy detail about the perils of intemperance in Intemperance: Its Evils, Causes, and Remedies, suggesting that conditions like mania and “lunacy” could be attributed to excessive indulgence of spirits. 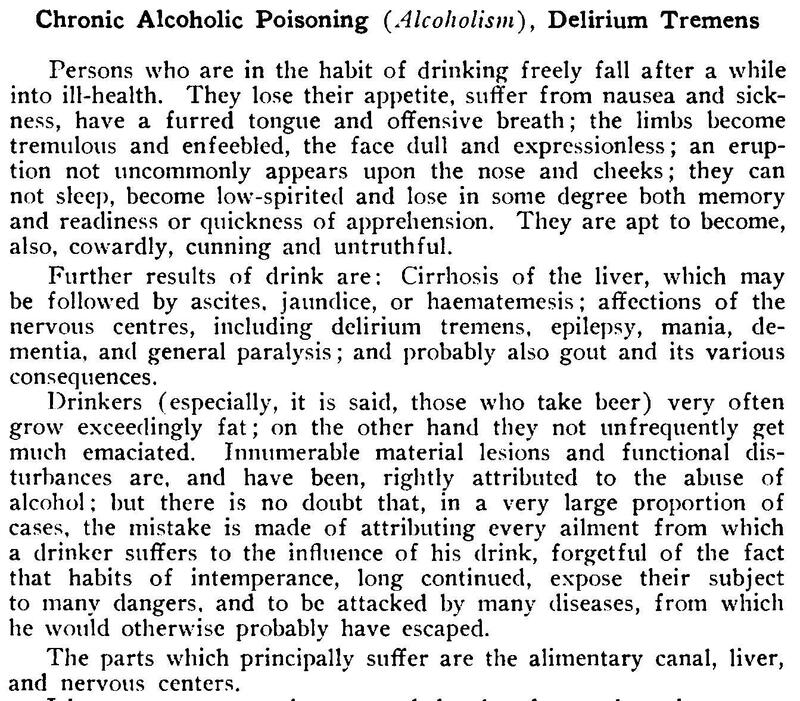 Because intemperance or alcoholism can lead to or allow the body to become more susceptible to so many different health problems, it’s impossible to know what exactly killed Elisha, Howard, or any of the other people listed in the mortality schedules with that COD without further information or a doctor’s report. Andrews, William. “Curious Epitaphs.” W. Andrews & Co., 1899. Index [database on-line]. Provo, UT, USA: Ancestry.com Operations Inc, 1999.
in Philadelphia, 1764-1860.” University of California, Davis. 2007.